Having a little fun here today! Isn’t she just stylin’? 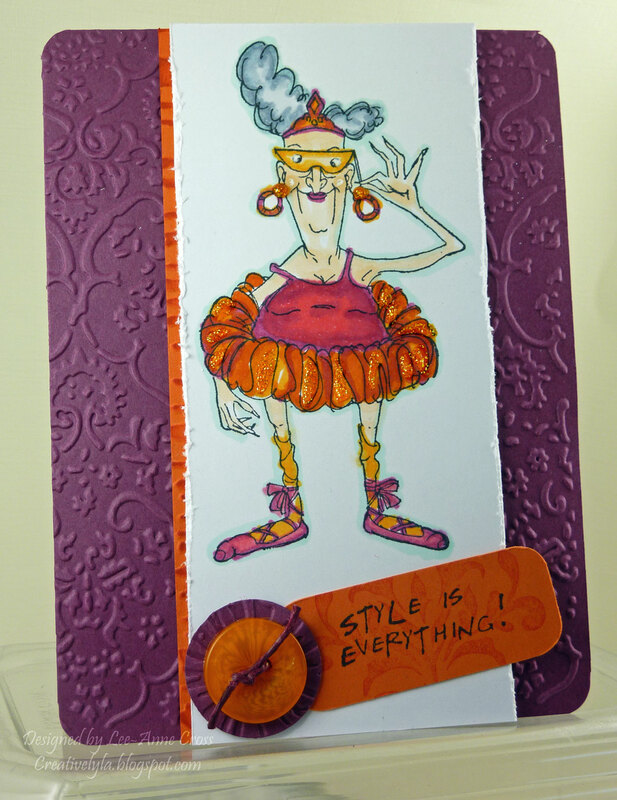 From her knobby little knees to her oh so colorful tutu, Ballerina Eunice is quite the picture of style! Don’t you think? This is for the Color Challenge at Splitcoast using Rich Razzleberry, Melon Mango and Tangerine Tango. And, for Sketch Challenge 340, also at Splitcoast. The cardbase is Rich Razzleberry in the standard A2 size. It’s been dry embossed and I used the corner rounder punch on all four corners. Next is a piece of Tangerine Tango that’s also been dry embossed and sponged with a bit of Melon Mambo. The image has been stamped in Memento Tuxedo Black and colored with Copics. I added some Stickles for a little bling on her tutu and her earrings. And I used a white gel pen to enhance her eyes and cheeks. The sentiment has been stamped in the same black ink and again, I used the corner rounder punch. It was also overstamped with a damask image in Melon Mambo. Next, I used an embossing folder for the piece under the button and then used a round punch to punch it out. And finally, I colored the hemp twine with a marker and topped the embossed circle with an orange button. hello,i just wanna ask how you do you put ur sign in the end of ur' post?